To celebrate National Poetry Month, a host of writers are sharing their love of poetry — with free poetry books! (Thanks to poet Kelli Agodon for orchestrating this worldwide event). For my part, I am giving away two books to two lucky winners (includes free shipping to anywhere in the world). • Leave a comment on this post any time before May 1, 2010. Include your name and contact info. • On May 1, two winners will be chosen in a random drawing of names. • Check back and see if you are a winner! A word-art collaboration featuring poems by Drew Myron and interpretive paintings by Tracy Weil. • Enter now! Good luck and good reading. Winner of Forecast, a word-art collaboration by Drew Myron and Tracy Weil, is A.M, also known as Amber (Dean) McQuillan. 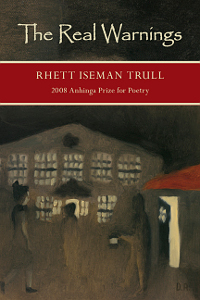 Winner of The Real Warnings by Rhett Iseman Trull (one of my favorite poets and poetry collections), is Matthew Thorburn, a poet living in New York City. The Poetry Book Giveaway was created by poet Kelli Agodon to celebrate National Poetry Month and promote a love of, and appreciation for, poetry. Over 50 bloggers took part, giving away more than 100 poetry books. The event has been a wonderful way to explore and discover a world of new, unknown and established poets. Many thanks to Kelli at Book of Kells for including me as a Giveaway host, and to everyone for stopping by and entering the drawing. See you next year!